When you have multiple missing teeth, you could be a candidate for a removable partial denture. With one or two missing teeth, you can replace them with a dental bridge that is anchored to the adjacent teeth. But when there are more teeth missing, it is too much strain on the anchor teeth. 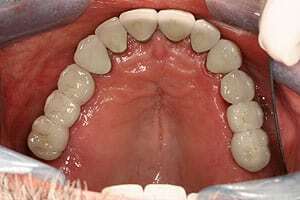 A removable partial is partially supported by existing teeth and partially supported by the tissue. The photograph on the right shows a partial denture replacing five teeth. 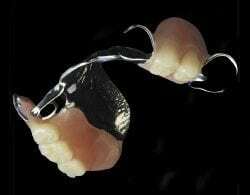 It clips to other teeth and also rests on the tissue. 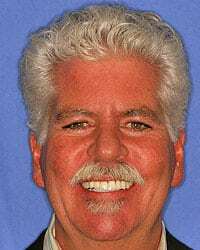 Dr. Thein has placed many partial dentures for patients, because they are economical. But patients are often annoyed with them because of the discomfort of wearing hardware in their mouth. The clasps also can show when they smile, and they can catch food. But more than that, they also place stresses on the abutment teeth. When teeth break down because of decay or periodontal disease exacerbated by the denture, it needs to be remade or altered. Too often, partial dentures progress to eventually be replaced by full dentures. For this reason, many patients prefer having dental implants in a situation like this. Implants don’t stress the adjacent teeth. They do not catch food. There is no uncomfortable or unsightly hardware. Here is a patient named Stan who came to us from West Virginia. To look at his face or even in his mouth, you wouldn’t know that he is missing ten teeth—six on the upper and four on the lower.When he returned to West Virginia after being treated by Dr. Thein, he said: “I can smile again and my bite is so comfortable. I can’t wait to get a steak from Ruth’s Chris Steak House!” Stan has dental implants instead of removable partial dentures. Stan doesn’t need any clasps or hardware in his mouth, because his missing teeth are replaced with dental implants.